Welcome to the Spotlight series which will be featured on this blog and its corresponding YouTube channel! The series will feature people and/or organisations that are doing their bit (no matter how big or small) to give back in some form or the other to society – people and the environment. There is a lot of complaining going on about societal challenges; and the motivation behind this series is to firstly, show that there are people who actually care and are putting their concern into action; and secondly, to encourage people who would like to do more and support such causes. – Organised a math and science quiz competition (Sciletes Competition) for senior secondary school girls in Lagos with the aim of encouraging them to take such subjects even more seriously and consider embarking on further studies in them. 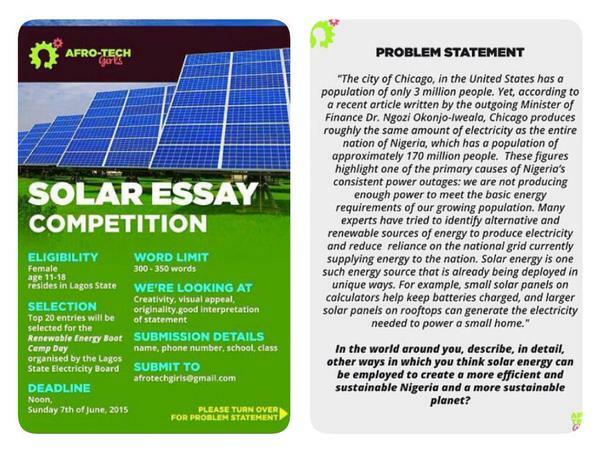 – Put together an essay competition for girls from the ages of 13 to 18 to recruit students for the Lagos Power Kids programme organised by the Lagos State Energy Board. And this is just the beginning for them. ATG is developing a mentorship platform to provide young girls with actual role models in STEM fields. They also hope to begin scholarship schemes hat will motivate young girls to attain their dreams. It’s all so wonderful and they have my full support. I’m sure the ATG ladies would love to hear from you – ideas, suggestions, volunteering possibilities, or any other support you’d like to offer. Go AfroTech Girls! Stay tuned for more features! And if you have any suggestions for organisations/people that you think should be on this please leave a comment or email me at tamiloreoni@gmail.com. This entry was tagged Afro-Tech Girls, girls in STEM, NGO, Nigeria, non governmental organisations in Nigeria, non profit organisations in Nigeria, spotlight feature, STEM, STEM careers for girls. Bookmark the permalink. Reblogged this on Yagz Journey. Thanks for believing in the ATG vision and bringing us to the Spotlight. Hmnn… A great initiative by founders. Keep it up ladies. I know it’s a gal thing (LOL) but we the guys are there if any support is needed! To build youths that have a yearning for Christ! We spread the gospel with speed!